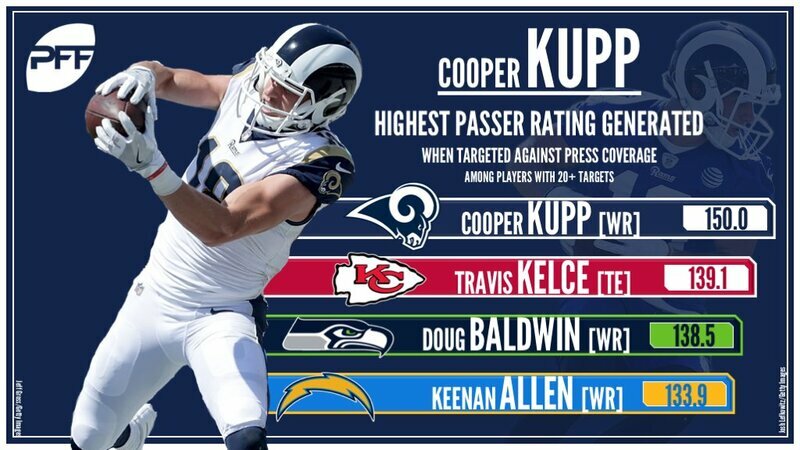 The full article list ten players I just cut and pasted the section on Kupp and added a different picture (which has good PFF data) as I couldn't use the original picture. I figured I'd pass on the Jimmy Garoppolo talk. The Los Angeles Rams dealt with back-to-back hardships last season. Following their first regular-season loss, in Week 9 against the New Orleans Saints, Cooper Kupp went down with a torn ACL in Week 10. At that point, he led the team in touchdown receptions with six. Although Los Angeles won an offensive showcase against the Chiefs in its next matchup, quarterback Jared Goff experienced a rough stretch late in the term. He didn't throw for multiple touchdown passes in a game until the regular season finale against the 49ers' 28th-ranked scoring defense. Seemingly, Kupp's absence sapped a good portion of the Rams' offensive firepower. Now, with running back Todd Gurley's arthritic knee, Goff will have to further elevate his game. A healthy wide receiver trio, with Kupp, Brandin Cooks and Robert Woods, should help the third-year signal-caller in 2019, which likely results in a production boost. According to Clarence Dennis of the Rams' official website, Kupp "feels good," and said, "I think I’m where I’m supposed to be" in terms of recovery. The Eastern Washington product has caught 102 passes for 1,435 yards and 11 touchdowns in 23 contests. Assuming Kupp suits up for a full season, he'll continue to shine within head coach Sean McVay's innovative offense. Kupp improved his catch rate from 66 percent to 72.7 percent between his rookie and second terms. He's also tied with fellow wideout Robert Woods for most touchdown receptions (11) on the team over the last two seasons. Edited 1 time(s). Last edit at 04/15/2019 11:37AM by Rams Junkie.